In CLO editor Jennifer Shahade's latest blog entry, she reviews IM Josh Waitzkin's The Art of Learning. In the new book, Josh writes about what he learned about learning from championship careers in chess and Tai Chi. 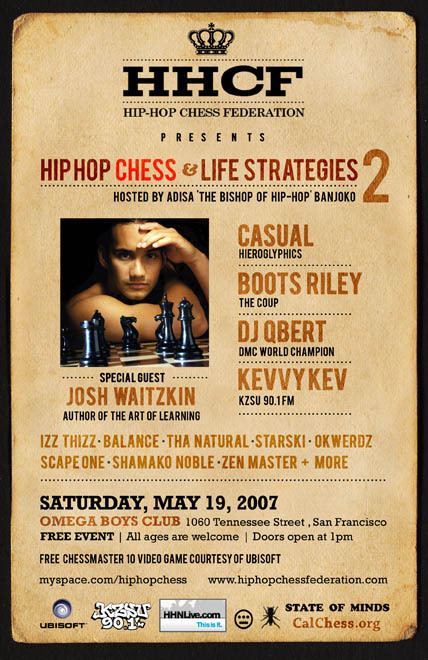 Josh Waitzkin will be signing The Art of Learning in New York on May.15, 2007 at the Astor Place Barnes and Noble (6th Avenue and 8th St.) He will also be in San Francisco on May 19 promoting and signing his book at an exciting event hosted by the Hip Hop Chess Federation called, "Hip Hop Chess and Life Strategies II." CLO will tell you more about the Hip Hop Chess Federation and the May 19 event soon. Top 10 Reasons Not to Quit Chess for Wall Street U.S. Championship Field SetMarcel Earns 1st GM Norm in Miami Macauley Blogs from HollandJennifer on South Africa: Part IFantasy Chess Preview Stripunsky Wins Space Coast OpenElementary Nationals Preview Elementary Nationals Update Down to the Wire in Nashville Fantasy Chess is On! Elementary Nationals Concludes Jennifer Blogs on the Art of Learning Last Chance for Fantasy Chess U.S. Championship Begins Fun and Games in Sofia Alexes and Ildar Take Lead in Champs2007 U.S. Women's Champs NewsShabalov Leads; Hikaru Breathes FireInside the Team Room Shabalov Glides to 4-0 Shabalov on a Perfect 5-0. Onischuk Nicks Tourney LeaderTopalov pulls a comeback in SofiaFantasy Chess Update Shabalov and Onischuk Share Lead Fantasy Chess UpdateAlex and Alex Still on Top Fantasy Chess Winners! Alex Shabalov: U.S. Champion! Gata Wins Game Two in Elista! Chicago Open: Upset City Gata Wins Again! Milov Takes Chicago OpenDr.D's Check Up: A Flying Finn Hip Hop Chess in San Francisco Kamsky Advances in Elista!